Attention History Sherlock Holmes Investigators! 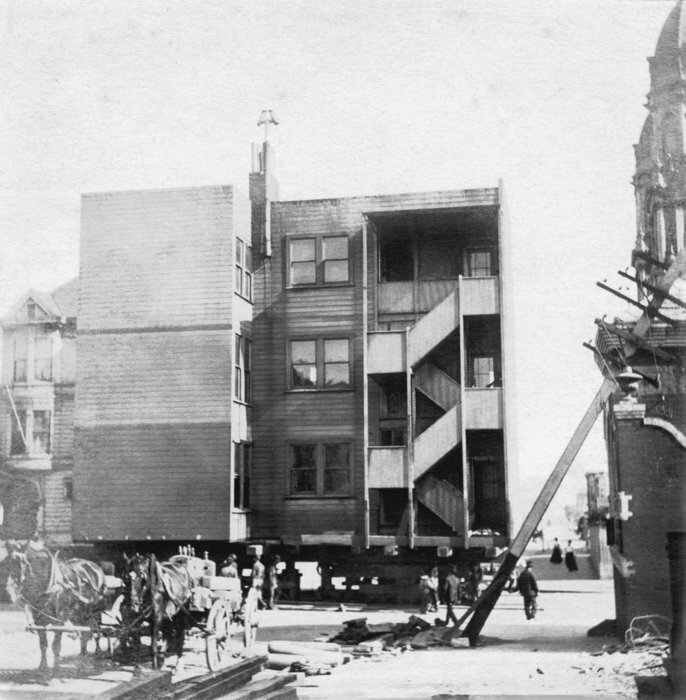 Can you solve these unidentified San Francisco moves? If you have any information about these moves, please email me! And put ‘Moving Information’ on the subject line, and refer to the photo image number associated with each caption. The terrain looks to be San Francisco, but which neighborhood? 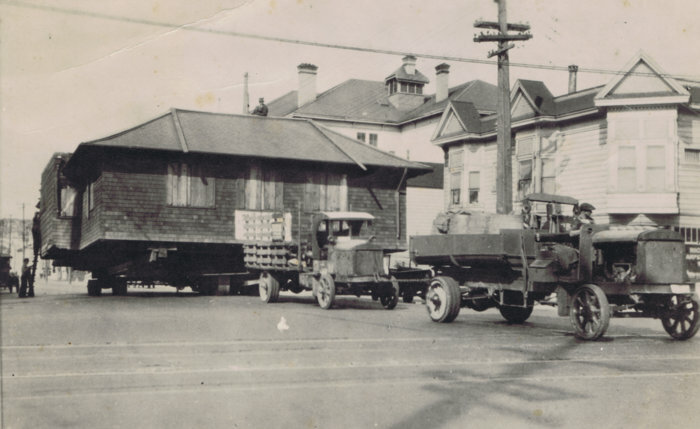 These movers are Mac trucks - the company had a truck of this style in 1910, which changed around 1918. 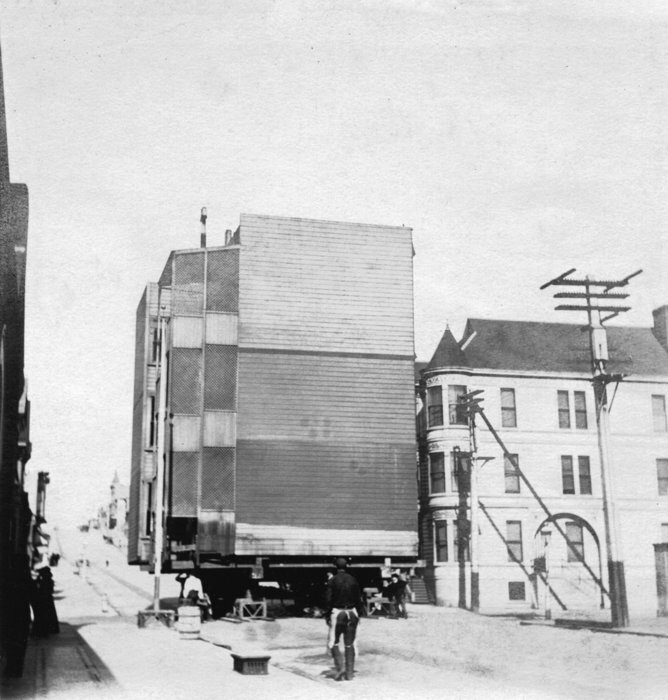 We are looking at a building being moved across Geary Street (now Blvd.) at Arguello Blvd. 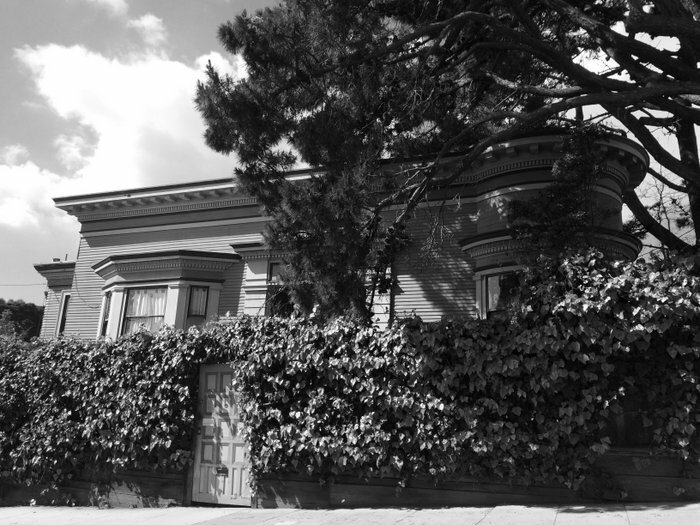 The view is toward the north on Arguello, and the corner buildings was identified in 1913 as a French Laundry on ground floor, with living units above, which has the angled bay window, and projected bays along the side. The addresses of the corner building were 498 Arguello and 3650-3652 Geary. The unique roof in the background was originally called Richmond Grammar School, but at the time of this move was renamed Roosevelt Grammar School. Today all this has changed. The NE corner is the parking lot for a Wells Fargo branch and about 1930, the Roosevelt Grammar became Roosevelt Jr. High, a brick building designed by Timothy Pflueger. The question is where they moving the building from and where to? I can only speculate where it came from, but there was development along Arguello, to create a fine boulevard as it had been so named in December 1909, from First Avenue. 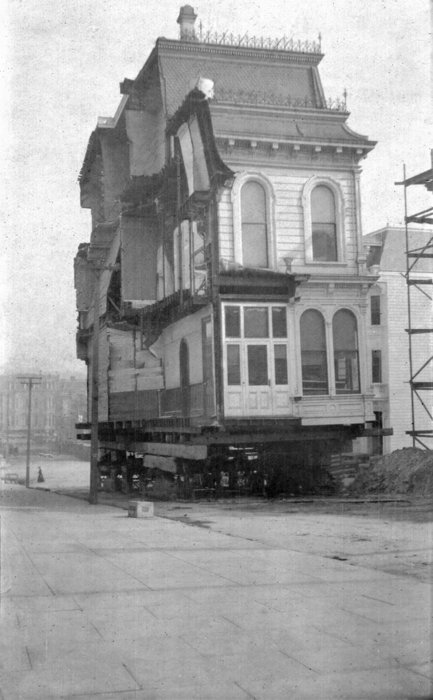 This is not a unique building being moved, but most likely it had occupied a lot that was more desirable for other construction, because from Geary to the Presidio Gate was intended to be much classier residences. The 500 block, across Geary, was itself across from Odd FellowsCemetery then (until all graves were removed in 1939-40). The land value across from the cemetery was definitely less than the blocks north of Geary which were near the more prestigious Jordan Park residential tract, and a few blocks south of Presidio Terrace, a very exclusive enclave. 3. Today, of course, demo and reconstruction is so simple, and moving, with permits to block traffic, move overhead wires and all the rest is a huge expense, but there was a time when the building materials might have been more valuable than the labor, and moving even a simple cottage was cost-effective. I want to look at what was on the property where Temple Emanuel would be built at Lake and Arguello. The synagogue complex was built during the early 1920s, so site prep was earlier. I am only guessing on the age of the moving vehicles, but we are in the general range. If you find a picture of the little shingle caretakers cottage on its original site, we might get lucky. Aside from their names on moving projects, these movers are a MYSTERY. What is their background? How did they enter the building-moving business? 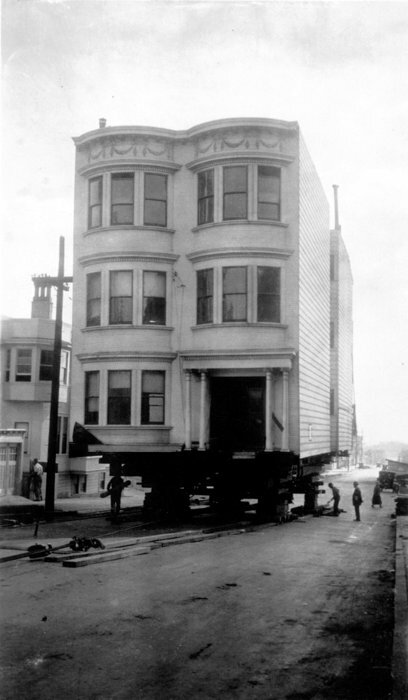 How many buildings did they move in San Francisco? These are the movers, their eras, and what has been found so far - please email if you have further details to share on these mystery movers and their legacies! a Rincon Hill house exists on a postcard. Housemover's Union #1 in protest of fees. were they, how many members did they have? 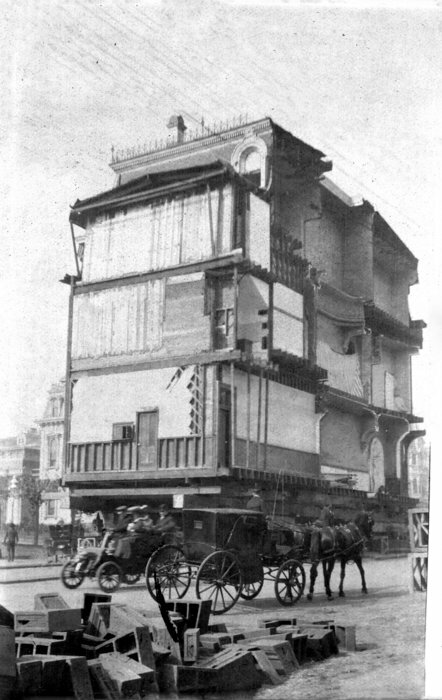 his history, what other buildings did he move? they? What is their history?